This collaborative effort between Willits and Sakamoto was recorded live during a series of improvisations at Ryuichi Sakamoto’s studio in New York almost two years ago and edited down to just under an hour and seven tracks. 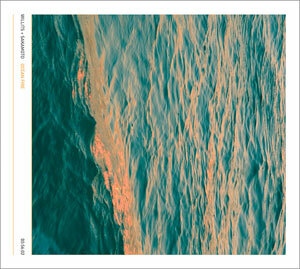 Ocean Fire combines Willits’s guitar work and Sakamoto’s contribution on the piano, processed into dense layers of sounds which ebb and flow in gentle tides or run in powerful underlying currents. There is an undeniable uniformity of sound running through the whole record as Willits’s and Sakamoto’s respective parts thaw into one another, yet each piece casts a totally unique mark on the entire work. On opening track Toward Water, Willits and Sakamoto devise warm and voluptuous sonic drapes, adorned with occasional granular overtones, which slowly evolve from tightly woven soundscapes to vast nebular forms over the course of the piece. Umi, which follows, appears to stem from a similar but is cut short just before the three minute mark, leaving a disconcerting vacuum before the gritty tentacles of Sea Plains reach out. Primarily built around statics and crackles and covered with dense metallic sheets of noise, Willits and Sakamoto find themselves between post industrialism and isolationism, but Sentience brings them back on more hospitable terrains. More peaceful and ethereal, this composition offers a welcome relief after the abrasive textures of its predecessor and provides an opportunity to clearly witness the subtle change of flow and density that the pair constantly applies throughout Ocean Fire. There is, in the last three tracks of the album, a notable shift toward denser soundscapes, especially on Chi-Yu and Cold Heat. Here, the rising tide of increasingly heavy sonic layers progressively crushes everything in its path. While both pieces are somewhat linear and monolithic, the pair draws on rich overtones and textures to permeate the austere grounds on which these two pieces develop. Ocean Sky Remains closes the album and feels as if the calm is returning after the devastating effect of a storm. While there is still a trace of the sombre clouds of the two preceding tracks, the atmosphere is undeniably lighter and less oppressive, leaving a strong impression of tranquillity as it eventually dies down. It is virtually impossible to distinguish between Willits’s and Sakamoto’s contribution, so tightly are their respective inputs woven together and so extreme is the treatment of the original sources, yet it very much serves the work by creating an extremely cohesive and unique sound distanced from the pair’s usual exploratory grounds.